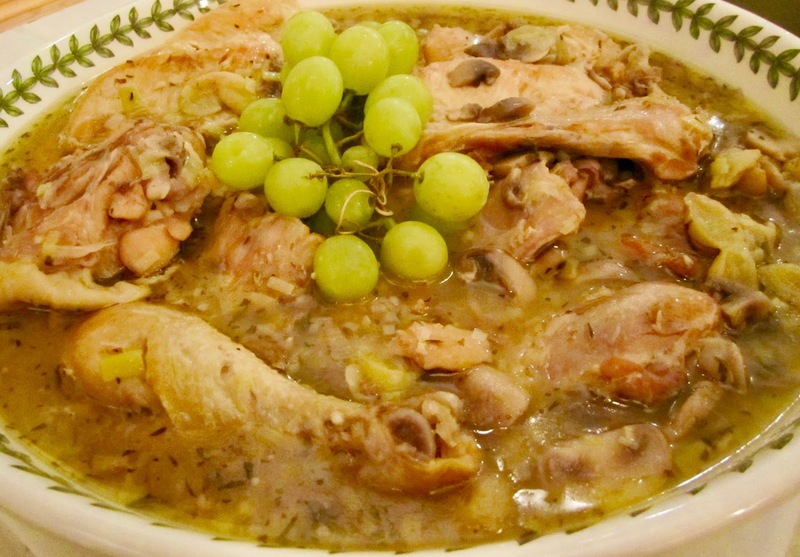 This is a wonderful country french chicken dish that I have made for years. It can be made earlier in the day and reheated before serving. I dress this dish down or up depending on the occasion. If I want to make it more Sunday or company fancy I use split chicken breast, or for everyday I use an assortment of chicken pieces. Either way it is an easy and wonderful meal that will be enjoyed by everyone. 2. Heat butter and oil in large, heavy skillet, brown chicken, a few pieces at a time, turning on all sides. Remove chicken as it browns. When finished browning chicken remove any excess drippings except 2 tablespoons. 3. Add mushrooms, garlic and leeks to skillet and cook for about 3 – 5 minutes until until cooked. 4. Wish together flour, wine, and chicken broth add to mushroom mixture. Add salt, rosemary, thyme, pepper, bay leaf, and grapes to pan. 5. Bring just to boiling, stirring. 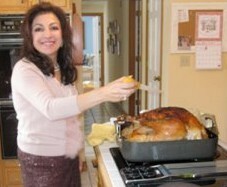 add browned chicken: reduce heat and simmer covered, until tender – about 30- 40 minutes: turn occasionally. 6. I like to serve this over couscous but you can serve over white rice. Cook couscous according to package instruction. Place couscous in large casserole dish. Place Chicken on top and then pour sauce over. Garnish with cluster of green grapes.